The Intervention Specialist: Mild/Moderate licensure and degree program is offered at the graduate level. The program can be completed on either a part-time or full-time basis. 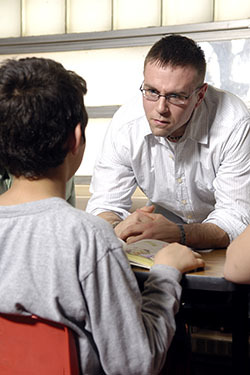 The Intervention Specialist - Mild/Moderate program of study provides a multiage license and a Master of Education (M.Ed.) degree. Candidates who have an undergraduate degree in education may have already met some of the program requirements. Please contact the Intervention Specialist program director for details. Candidates are eligible for an Ohio Resident Educator Intervention Specialist license in Mild/Moderate Needs (K-12) after successfully completing the program requirements and passing the state required Ohio Assessments for Educators for teacher licensure. Submit a clear FBI and BCI criminal background check. Submit a clear FBI and BCI criminal background check. You can make appointments for FBI and BCI background checks by calling the Educational Resource Center at (937) 775-2878.